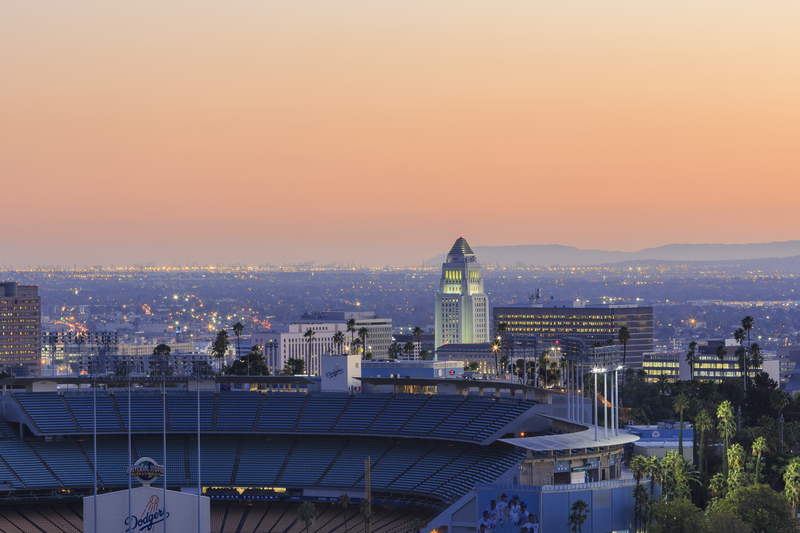 Nestled in Chavez Ravine and framed on one end by the steep San Gabriel Mountains and on the other by a jumble of Downtown LA skyscrapers, Dodger Stadium has been heralded for its beauty since the day it opened in 1962. It’s especially striking when the sun sets: The clouds turn bright pink and the sky is painted purple and gold. “A cotton-candy sky with a canopy of blue—looks good enough to eat,” said legendary Dodgers broadcaster Vin Scully. Right-field pavilion 302 is the most fun. But if you want to grub, snag a ticket in the all-you-can-eat section. Angelenos notoriously arrive late (in the third) and leave early (in the seventh), either because they’re apathetic about the game or because traffic is a monster. Ditch your car and take the Dodger Stadium Express Shuttle instead. Catch a game when pitcher Clayton Kershaw is due to start—he’s one of the greatest pitchers in the sport right now, and maybe one of the best of all time. You’re allowed to carry in your own food; just don’t pack glass bottles or cans. For day games, a hat and sunscreen are musts. But do not bring a beachball. It’s a picturesque setting for a great ball game. The Dodgers return today for their first home game of the 2017 season, and it could be the start of another thrilling year. SB Nation’s Eric Stephen says not only should the Dodgers win the National League West again, they are also one of a handful of teams favored to win the World Series. A cotton candy sky with a canopy of blue—looks good enough to eat. 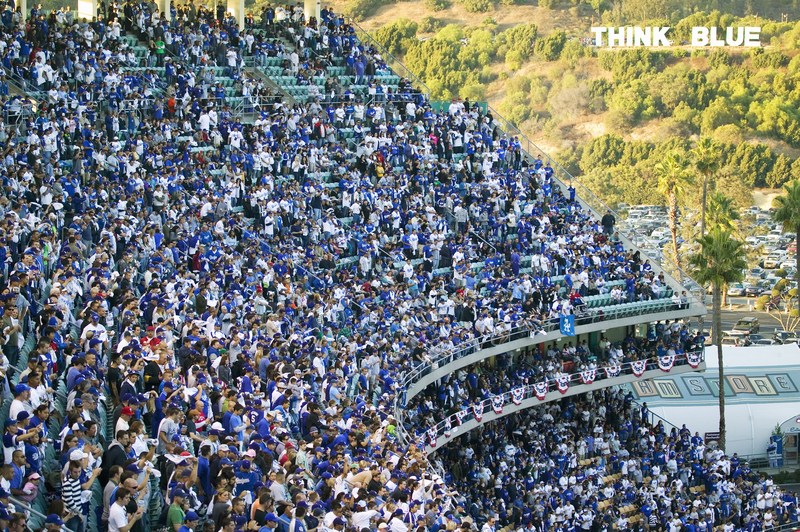 Whether you’re visiting Dodger Stadium because it’s a beautiful LA institution, a local summer tradition, or because you’re a longtime fan, we present this venue guide, complete with insider tips on the best ways to get there (hint: it’s not driving), the most fun section, and where to find elote slathered in mayo and cheese. If your calendar is wide open, SB Nation’s Eric Stephen says to try to time your attendance around Clayton Kershaw. He’s the team’s pitching ace and is regarded by many as the best pitcher in baseball. He starts every fifth day/game or so, so it’s hard to make plans too far in advance, but catching one of his starts is a must. Vin Scullyisconsidered the greatest sports broadcaster ever. 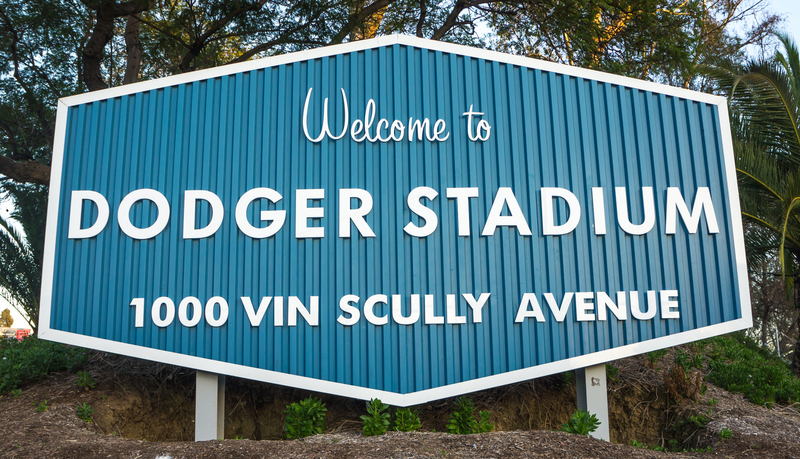 He retired last year after 67 seasons as the voice of the Dodgers, but he’s a local legend whose name will live on forever—the street that leads to the stadium is named after him. Entering his second season, shortstop Corey Seager is only turning 23 years old, but he’s a budding superstar. He’s a daily must-watch. A standout in 2013-14, YasielPuig was rather ordinary last season. The Dodgers expect improvement this year, but aren’t counting on it. It would be a great bonus. We’ve tested all of the methods and can tell you with absolute confidence that driving into the stadium is not enjoyable. If you don’t have to drive, don’t. The best option is to take the free Dodger Stadium Express shuttle from Union Station, which you can access via Metro’s Red, Purple, and Gold lines, along with Metrolink and Amtrak. Alternatively, we suggest riding a bike (there’s bike parking in multiple locations), grabbing a Lyft (though rideshares can get stuck in traffic, too), or walking from Echo Park or Chinatown’s Gold Line station. If you have to drive, save money by paying in advance online. Sure, some sections are fancier than others, but truly, even in the nosebleeds, there are no bad seats. The stadium was designed without pillars and posts, so views from every seat are totally unobstructed. Fans cheer at a 2008 playoffs game. Ready to drop a good chunk of change? Go nuts at the Dugout Club, where an individual ticket costs $500 to $1,050. These seats wrap around home plate between both dugouts. Fans have their faces right up in the action and are treated to private restrooms, a free buffet, and in-seat waiter service. On a budget? Consider the cheap seats in the Top Deck area (TD 1-13 on a seating map). The view of the game is great from that high up, and the chances of getting hit in the face by a foul ball decrease greatly. Dodger Stadium is not a foodie destination. But if you know where to go, you can find some tempting options. Dodger Dog and garlic fries. If you want to grub really hard, buy a ticket (from $33) to the all-you-can-eat section in right field, where you can get down on unlimited Dodger Dogs, nachos, popcorn, peanuts, and soda. For Eater’s full rundown on where to eat in the stadium, click here. 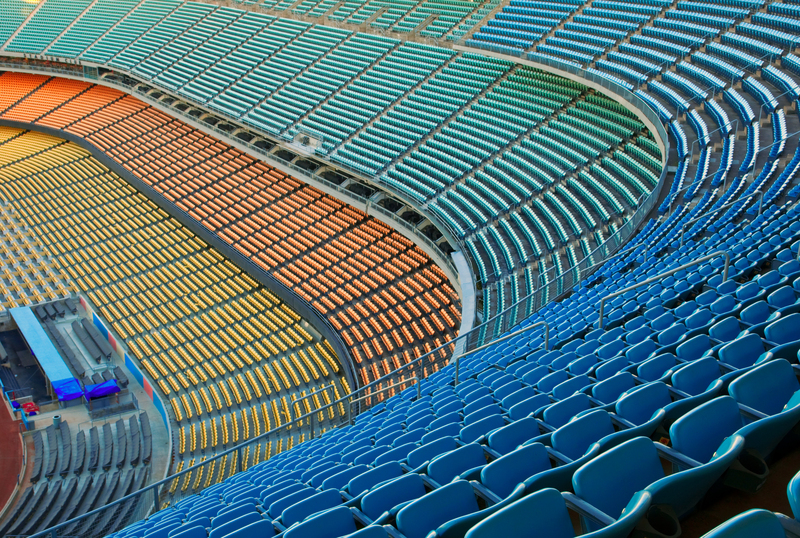 Originally a display of fashionable design and modern conveniences, the stadium has stood the test of time. A visitor from the first season would recognize the clean midcentury modern lines, an architectural style that has come to define LA. 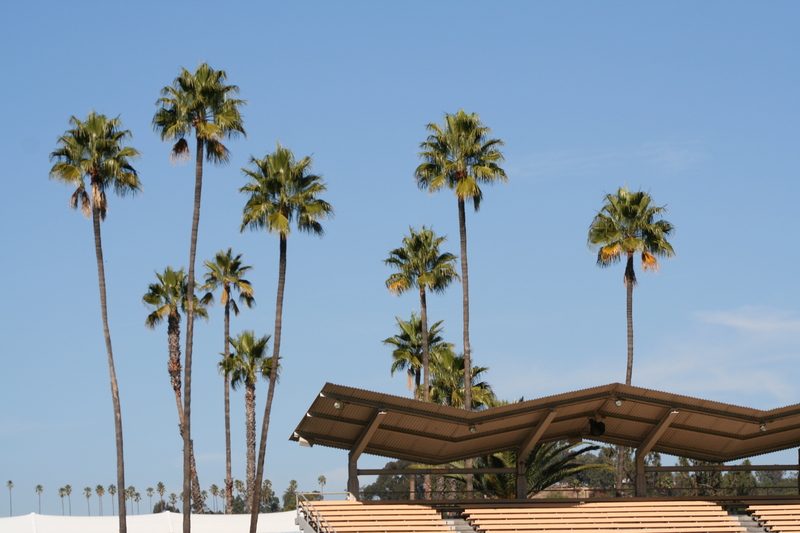 Construction of the modernist stadium, designed by Emil Praeger and complete with terraced entrances, exposed concrete, and wavy aluminum shade structures above outfield bleachers, was one of the most ambitious projects ever undertaken in Los Angeles. Construction crews moved about 8 million cubic yards of earth to carve out the stadium’s foundation and flatten the surrounding terrain to create the venue’s massive, baseball-glove-shaped parking lot. A vault on the third floor holds the franchise’s TV and radio broadcasts, including Vin Scully’s original welcoming call from the Los Angeles Coliseum, where the Dodgers played when they first relocated to Los Angeles. A plaque on the upper deck covers a time capsule that holds, among other cool artifacts, a program from the first game played at Dodger Stadium. 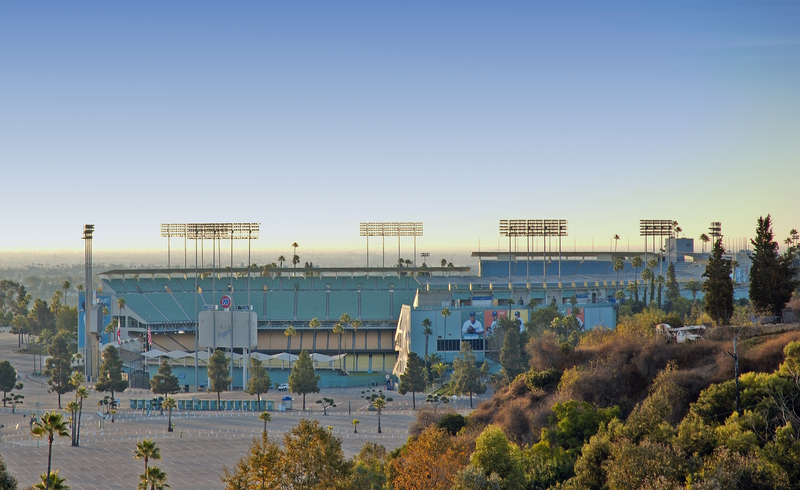 As beloved an LA landmark as Dodger Stadium has become, its history is steeped in controversy. Chavez Ravine, now home to the ballpark, was once a Mexican-American community occupied by hundreds of families. In 1950, it was selected as the site of a new housing project, and most of these families were displaced by the city through eminent domain. The housing project was eventually shot down and the city sold the land to Dodgers owner Walter O’Malley at a lowball price. When construction began on the new stadium, police famously dragged longtime Chavez Ravine residents from their homes so that demolition could begin. That didn’t cork enthusiasm for the stadium—some 500 Angelenos turned up for groundbreaking ceremonies in 1959. A Chavez Ravine resident is dragged from her home in 1959 for construction of Dodger Stadium to begin. The Dodgers fell to the Cincinnati Reds in their first game in their new stadium, but the big story of the day wasn’t the final score. It was that Los Angeles finally had a Major League Baseball team and the Dodgers had finally played a home game in their very own grand ball park. Back in Brooklyn, they played at too-small Ebbets Field, and when they first moved West in 1958, they temporarily played in the Los Angeles Memorial Coliseum. Now the third-oldest Major League Baseball stadium in the nation, Dodger Stadium has left Angelenos with more than 50 summers of memories. — Associate editors Bianca Barragan and Elijah Chiland contributed to this guide.